As a Constitutional safeguard, the validity of Miranda decisions is only considered when detainees have waived their Miranda rights. Pragmatically speaking, such waivers are almost never examined unless they are coupled with damaging self-incriminations. A careful analysis of waiver decisions integrates Miranda comprehension and reasoning within a hierarchical model. Determinants of decisions involve systematic examinations of how arrestees weighed the pros and cons of both exercising and waiving Miranda rights. 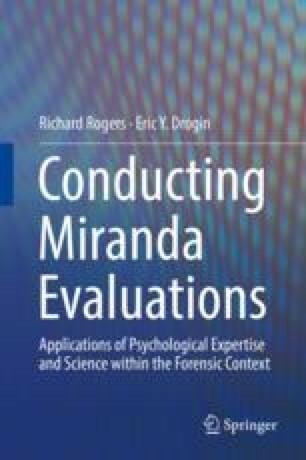 From a nomothetic perspective, the Miranda Reasoning Measure (MRM) is evaluated closely for aggregate scores in the Exercise and Waive domains. From a case-specific perspective, the MRM—as well as open-ended inquiries—provide detailed information via item-level analysis. This analysis is enhanced by the Blackwood’s “salience-probability” approach. In addition, Miranda waiver decisions may strongly be influenced by response styles, such as acquiescence and compliance, both of which are addressed in detail. American Psychological Association. (2017). Ethical principles of psychologists and code of conduct. Retrieved from http://www.apa.org/ethics/code/ethics-code-2017.pdf.